The friendly Turks and Caicos islanders, known as the 'belongers', rely almost solely on tourism for their livelihood and therefore welcome visitors to this Caribbean British Overseas Territory with open arms. The 'TCI', as the archipelago is known colloquially, is situated at the end of the Bahamas chain, around 575 miles (925km) southeast of Miami, Florida. The Turks, with their dry, scrubby landscape, are divided from the more lush Caicos Islands by the Christopher Columbus Passage. The pristine white beaches, vast coral reefs and crystal clear warm waters that surround this set of eight inhabited islands and numerous deserted cays draw honeymooners, scuba divers and vacationers in droves, with many visitors arriving by cruise ship. Everyone leaves smiling and de-stressed, and most return again and again to enjoy the tranquillity of this unspoiled tropical island paradise. The Turks and Caicos Islands are famous for the reef system that surrounds them, the third most extensive coral reef in the world, making it a prime destination for divers and snorkelers. Visibility and an abundance of marine life, as well as excellent dive facilities, ensure that diving is the number one activity on the islands. The channel that separates the Turks Islands from the Caicos Islands is a deep passage that is a major route for humpback whales, dolphins, and eagle and manta rays. The reef wall around the southern edge of South Caicos Island is said to provide the finest diving in the archipelago. The shallow reefs close to the shore are excellent for snorkelers and with visibility up to 200ft (61m) there is no need to be underwater to appreciate all the sights. 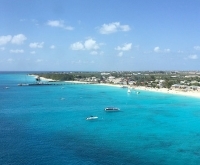 The most popular islands for holidaymakers are Grand Turk, the site of the quaint capital, Cockburn Town, and Providenciales ('Provo' for short), both well equipped with modern hotel, condominium and spa complexes that offer every tourist amenity. The other islands offer more rustic accommodation suited to romantics and nature-lovers who want to unplug from the real world for a while. Clocks, televisions and radios are hard to find on the laid-back cays, and the nightlife mostly consists of sundowners and stargazing.